AZD7762 is a potent and selective inhibitor of Chk1 with IC50 of 5 nM in a cell-free assay. It is equally potent against Chk2 and less potent against CAM, Yes, Fyn, Lyn, Hck and Lck. Phase 1. CAL120 cells were either untreated or pretreated with gemcitabine for 24 hours followed by treatment with AZD7762 and/or MK-1775 for an additional 2 hours (top) or 8 hours (bottom), before lysis. Western blot analysis of Cyclin B1, CDK1 (phospho-Y15 and total) expression, and β-tubulin as loading control. Rabusertib (LY2603618) is a highly selective Chk1 inhibitor with potential anti-tumor activity in a cell-free assay. IC50=7 nM, showing approximately 100-fold more potent against Chk1 than against any of the other protein kinases evaluated. MK-1775 and LY2603618 synergize to induce apoptosis in AML cell lines and primary patient samples. U937 and CTS cells were treated for 8 h. Whole cell lysates were subjected to Western blotting and probed with anti-γH2AX, -pCHK1, -p-cdc25c, -p-CDK1, -p-CDK2, -CDK1, or -β-actin antibody. Densitometry measurements, as described in the Materials and methods section, are shown below the corresponding Western blot. MK-8776 (SCH 900776) is a selective Chk1 inhibitor with IC50 of 3 nM in a cell-free assay. It shows 500-fold selectivity against Chk2. Phase 2. Western blots of proteins associated with Chk1 activation and apoptosis. CHIR-124 is a novel and potent Chk1 inhibitor with IC50 of 0.3 nM in a cell-free assay. It shows 2,000-fold selectivity against Chk2, 500- to 5,000-fold less activity against CDK2/4 and Cdc2. Combined effect of doxorubicin and CHIR-124 dose ranges in U2OS cells; means of triplicates are shown; each graph shows one representative of three independent experiments. PF-477736 is a selective, potent and ATP-competitive Chk1 inhibitor with Ki of 0.49 nM in a cell-free assay and also inhibits VEGFR2, Aurora-A, FGFR3, Flt3, Fms (CSF1R), Ret and Yes. It shows ~100-fold selectivity for Chk1 than Chk2. Phase 1. Cells were treated at the same concentrations as in Caspase3/7 assay for 16 hours and total cell lysates were prepared for Western blotting. GAPDH was used as a loading control. GDC-0575 (ARRY-575, RG7741) is a potent and selective CHK1 inhibitor with an IC50 of 1.2 nM. SAR-020106 is an ATP-competitive, potent, and selective CHK1 inhibitor with an IC50 of 13.3 nM. CCT245737 is an orally active CHK1 inhibitor with The IC50 of 1.4 nM. It exhibits >1,000-fold selectivity against CHK2 and CDK1. 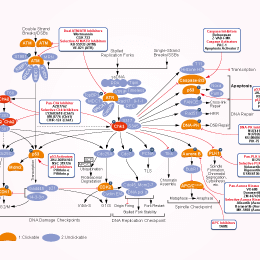 Chk2 Inhibitor II (BML-277) is an ATP-competitive inhibitor of Chk2 with IC50 of 15 nM. It is 1000-fold more selective toward Chk2 serine/threonine kinase than for Chk1 and Cdk1/B kinases. Prexasertib (LY2606368) is an ATP-competitive CHK1 inhibitor with a Ki value of 0.9 nmol/L. For CHK2 and RSK, its IC50 values are 8 nM and 9 nM respectively in cell-free assay. EW8 and TC71 cells were treated with increasing doses of prexasertib for 6 hours. Cell lysates were then collected and blotted for p-CHK1-345.